1 3/8" (35 mm) wide Ratchet Belt. Measure the belt around your waist and mark it, then cut it. Do this a couple of times to make sure that it is the right length that needs to be cut. Gunmetal buckle with a quick release lever on the side to pull up and slide the belt strap. A high grade easy to use and durable ratchet belt that can be use for all occasions. Synthetic or vegan leather belt strap. In order get the correct size. 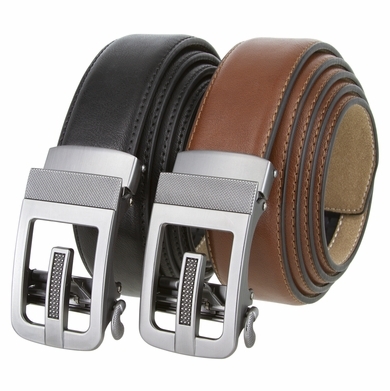 Measure a belt that is currently works for you from the fold where the buckle is to the hole where you wear them.